Whether practitioners or academic researchers, change is light on theory. I ran across an article called The Death Valley of Change. The authors, P. David Elrod and Donald Tippitt, displayed an extensive review of change models from the 1940s until 2000. 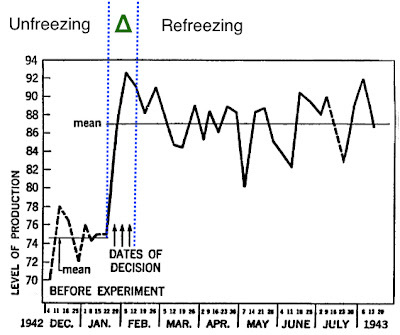 This adaptation from the death valley article shows a common display of the Kubler-Ross model. 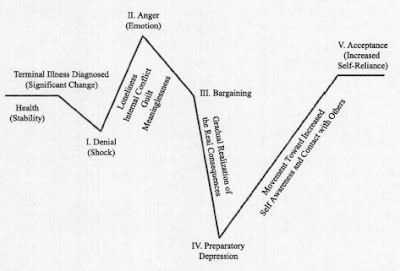 Stage 1, Denial, shows an initial drop, while stage 4, Depression, shows a much bigger drop. Katzenbach and Smith published their research on teams and their performance curve in a book called The Wisdom of Teams in 1993. It is similar to Kubler-Ross with an initial drop, but is much more optimistic. 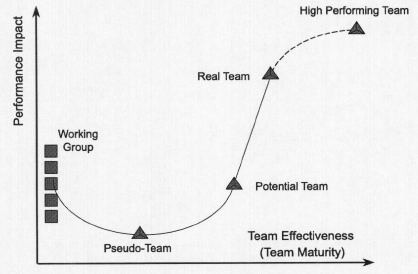 It is an idealistic model, describing mature, effective teams. While they did a fine job, they missed an opportunity to show Lewin's 3-step change theory, which does not have the "death valley" performance drop that the other models share in common. Lewin illustrates his model using statistics. His illustration is a backwards "Z" and has no death valley. The Lewin model seems more appealing from a business perspective. If the model describes the process and the result (response), what is the difference in the stimulus? For the Kubler-Ross model, the stimulus is death. Though fear is often used in organizations as a motivator for change, it wastes an awful lot of energy. For the Katzenbach and Smith model, the stimulus is team improvement. The model describes an effective team. For Lewin, the stimulus was a participative intervention. People support what they help create, and initially resist what they have no hand in deciding. Death valley describes a lack of understanding of how to infuse participation in the front-end of a change management intervention. Elrod, P. D., & Tippett, D. D. (2002). The "death valley" of change. Journal of Organizational Change Management, 15(3), 273-291.